Some of these services that are on high demand in Arlington, Texas include the smooth ceiling finish, orange peel ceilings, knockdown texture, drywall installation, and residential and commercial popcorn removal. Because of this high demand, we have several companies that offer these services to clients. The competition is tight and you will find every brand positioning itself as the best. Thus, customers can find it confusing to differentiate between genuine and fake companies. 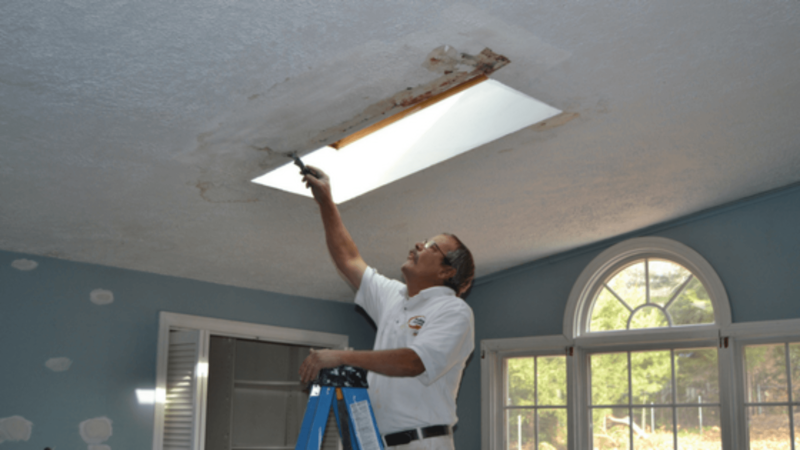 Arlington Popcorn Ceiling Removal Services remains to be a leading brand when it comes to the provision of all these services. You need a company that has the right skills and experience to handle any of the above tasks. The brand that you choose should also have the right equipment of you want high quality results. The other irreducible minimums are insurance and licensing. The best company will have a good reputation in the market. 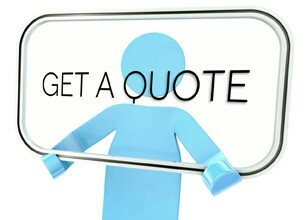 Therefore, you will have to read online reviews and talk to the previous clients to see the kind of services to expect. It is also good to visit previous projects and make sure that you are comfortable with the results that you see. All these elements will tell you that you are dealing with a brand that has the interests of its customers at heart. You don’t want to fall in the hands of greedy professionals whose primary interest is to reap the huge benefits of the industry at the expense of quality. Here is a brief description of some of these services to help you make educated decisions whenever you are finishing your property. Popcorn was a very popular look in the early eighties. However, this design has become outdated in the modern days. So many people in Arlington would like to remove the popcorn texture from their ceiling but they don’t know how to do this. The first step in residential and commercial popcorn removal is preparation. Remove all your household items from the room. If some of them are too heavy, place a duty plastic cover over them. Turn off electricity in the room because you will be using water. Remove any light fixtures from your ceiling and cover your walls with several layers of heavy-duty plastic. Put the plastic wall sheeting up the wall approximately a foot and tape the edges to block waters from coming below the baseboards. Note that some acoustic ceilings contain asbestos that were banned on 1978 because they have cancer causing agents. In such a case, only a certified popcorn removal contractor will be allowed to handle the task. These experts will send small samples of your ceiling to the EPA certified testing laboratories. After preparation, the next step is to remove the popcorn. Wet down the ceiling using plain water and a garden sprayer. Make several passes and allow the ceiling to soak up well in the water. Don’t apply excess water as it may damage the paper surface that is below the wallboard. Scrap the moist texture from your ceiling using a joint knife. 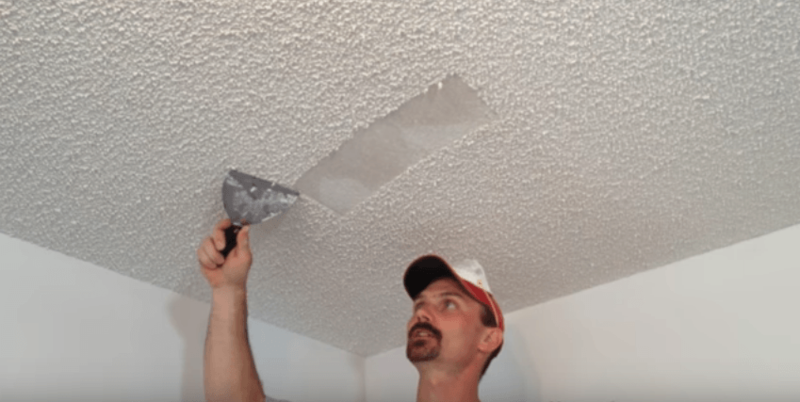 The popcorn ceiling will come out easily since the water does most of the work. If you discover that some spots need hard scraping, stop and apply more water. Wait for it to soak a bit before trying again. The third step is priming and painting. If by all means you gouged or cut the ceiling while removing the texture, use your taping knife and a joint compound to skin a thin compound coat on the surface that is damaged. Allow the area to dry for some time and then sand it lightly. 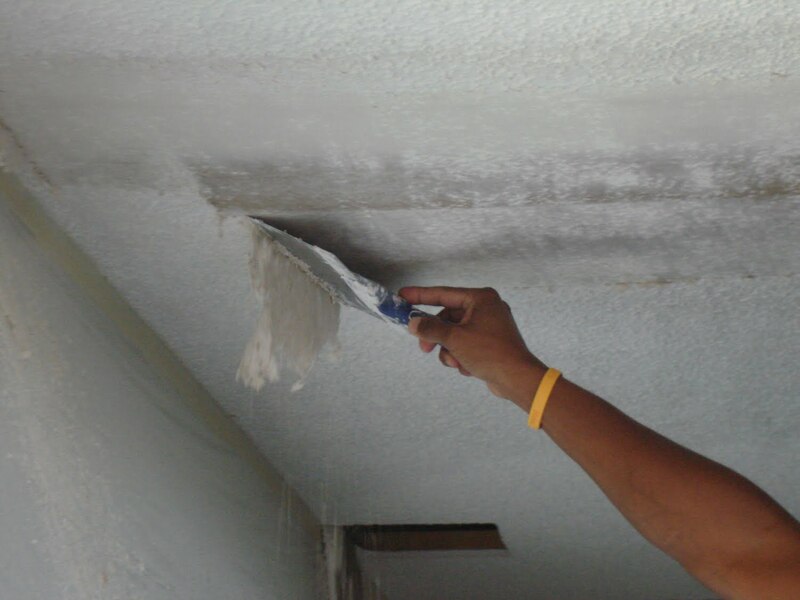 Use the Latex Primer to prime the surface of the ceiling. After you are done with the application of the primer, apply a latex coat paint. Apply another coat once the first paint dries. Clean-up is the last stage in residential and commercial popcorn removal. Remove all the plastic covers from your floors and walls. Begin with the plastic covers that are on the walls. You will discover that some texture will find its way to the floor. However, the texture comes out easily from hardwood and carpet floors. Keep your shop-vac close as it may come in handy during the clean-up exercise. Dry wall repair is not a complicated exercise as long as you know what you are doing. However, you must have some knowledge about the drywall repair materials and tools before you attempt to do it by yourself. You can produce a tremendously bad job if you don’t have the right skills and knowledge. The first thing that you will need is a dry wall compound (mud). The market has two options comprising of the all-purpose and light-weight options. It is easy to work with both of them and they retain a shelf-life room temperature of nine months. Make sure the drywall compound that you buy will be enough to complete your project. You also need to understand the difference between plaster and spackle. It is very hard for a layperson to notice these differences. The kind of mud that you choose will determine the durability of your new drywall. Sparkle is mainly used in small house repairs. Plaster is more common in historic and older buildings. You also need the right drywall repair tools if you want the best results. It is advisable to leave this work in the hands of professionals if you want highly durable and aesthetically pleasing drywalls. The drywall installation process encompasses several steps like preparation of the site for drywall installation, installing the drywall, installing the corner bead, tapping and mudding, applying the last coat of mud and then sanding. Drywall installation has completely revolutionized the way people work on their interior wall finishing. The technique finishes interior walls and minimizes the construction time considerably. Drywalls are popularly referred to as plaster boards, gypsum boards, or wall boards. You can either install it on your interior wall or ceiling. 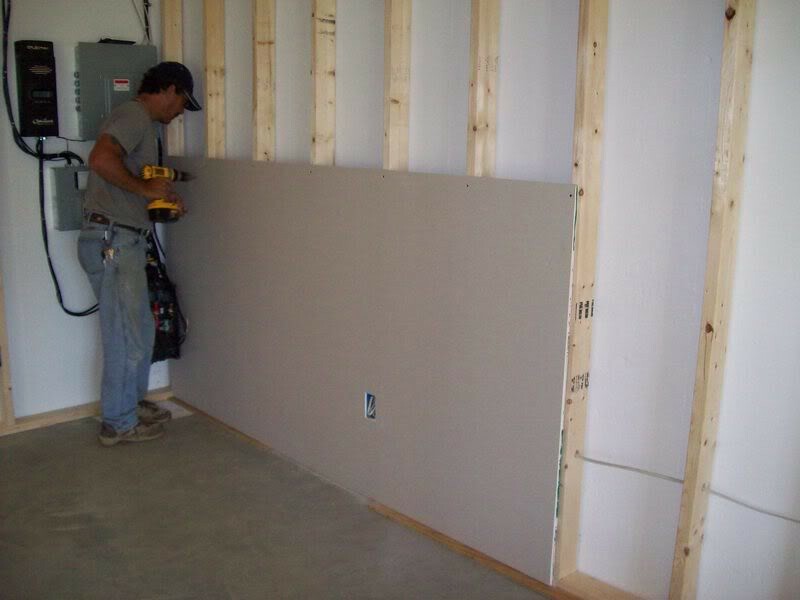 The size and thickness are the most important parameters to take into consideration during drywall installation. A drywall is a revolutionized technique in the niche of interior wall decorations. 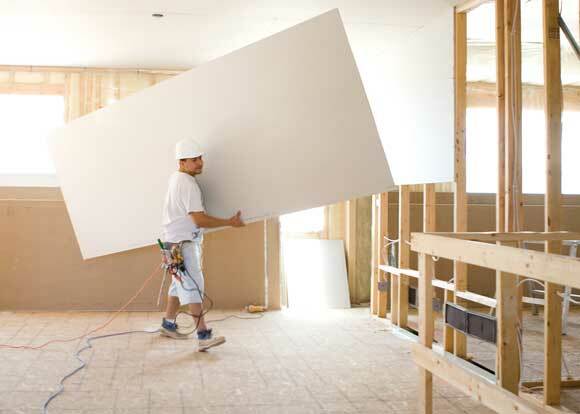 The preferred thickness to use in drywall installation are 3/8 inch, ¼ inch. ½ inch, and 5/8 inch. In this regard, your drywall installation contractor or architect to advice you on the most appropriate thickness for your drywall. After completing drywall installation, the next step is painting the surface. The knockdown texture can add a lot of interest on your wall. However, if you have a solid-coloured paint, you will reduce the textured appearance. The best way to bring out or enhance the knockdown texture is applying a color wash faux finishing on the wall. One approach to do this is using a brush in applying the colour on the wall and literally washing the glaze into the wall. You may have to blot off the excess glaze before you apply the brush on your wall. Once the glaze begins to dry, you need to use a dry cloth to wipe it off slightly. The paint that remains in the crevices will be darker than the knockdown surface. This will make your surface to have a more pronounced texture. After the finish dries completely, you may add another color. You can also repeat the same steps using a rag and not a brush. You can begin by practicing it on a poster board. Buy a tiny container of texture spray used in touching up knockdown walls. Spray it on the poster board and allow it to dry. Paint it with the base coat that is on your walls. Don’t skip any of these steps if you want the best results for your knockdown texture. 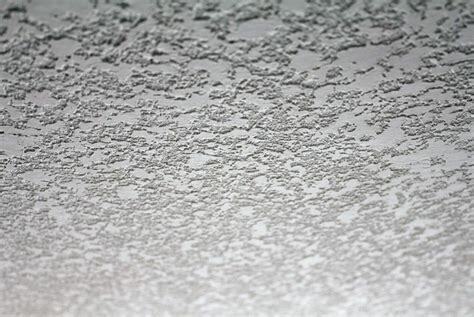 Arlington Popcorn Ceiling Removal Services will give you the best knockdown texture results. There are several benefits that come with texturing a ceiling. Some of them include controlling the sound levels in the home and hiding flaws. Orange peel is a texturing technique that creates a light and soft bumpy surface. The technique is largely popular because it has an appealing look and is easy to apply. You can get the best results of orange peel ceilings by hiring professionals. However, you can do it by your self if you have the best skills. The challenge with DIY projects is that you will have to hire the required equipment. Most people in the United States seem to love smooth ceilings. It is one of the most expensive alternatives as it is labour intensive to make sure that the ceiling has a perfectly smooth feel. The texture of these ceilings is similar to what you get on the walls. You will also have to prime and paint the ceiling to give it a consistent look. The primary advantage of this ceiling is that it does not retain dirt and other debris hence making it a perfect alternative to people who are suffering from allergies. 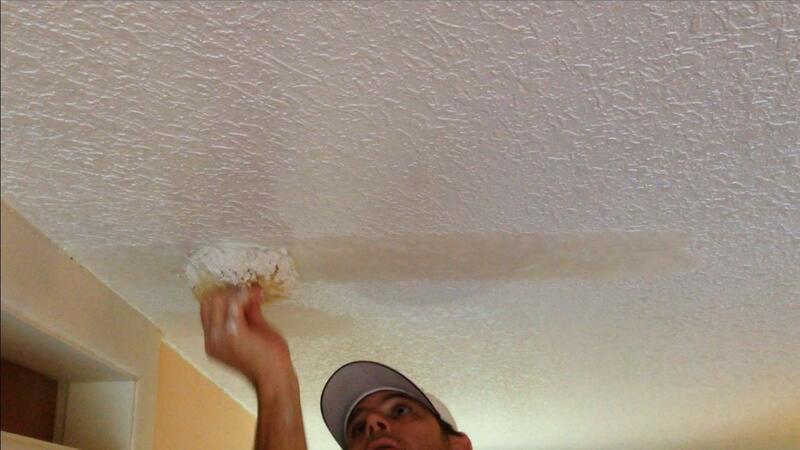 Arlington Popcorn Ceiling Removal Services will help you to get the best finishes on your surfaces.